Summary: This will be a fell unknown to many hill walkers but they will have passed by it on many ocassions as they travel along the A591 between Keswick and Grasmere- as I have done. Great How sits adjacent to the dam of Thirlmere on the eastern side of the reservoir. 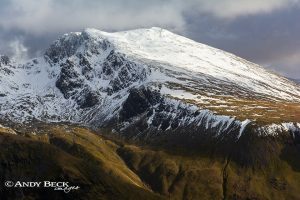 It rises to almost 1100′ and is mostly covered by woodland apart from the summit area which has been cleared in the past few years, opening up fine views of the surrounding fells. This is a fell which only just makes it into The Lakeland 365, Wainwright in his first list added Great How and its height of 1092′ as an afterthought, pencilling it in at the top of a page above other fells already listed. This is the only time it is named, failing to be included on his second revised list or the final 214 featured in the Pictorial Guides. He may have just considered it as the fell sits alone, sandwiched between the reservoir and the A591 and it would seem to offer great views of the length of Thirlmere and the fells which form the high walls of the valley, it also had a measured height on both the 1 inch O.S. and Bartholomew maps which most likely would have caught his eye. The downside of the fell is the fact that it is bascially a rounded mound cloaked in woodland (Greathow Wood) not unlike a bigger version of Dunmallard Hill near Pooley Bridge. There are no other points of interest either historical or geographical. 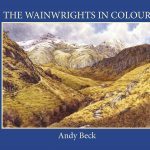 These reasons are the most likely that Great How was dropped from Wainwrights lists. 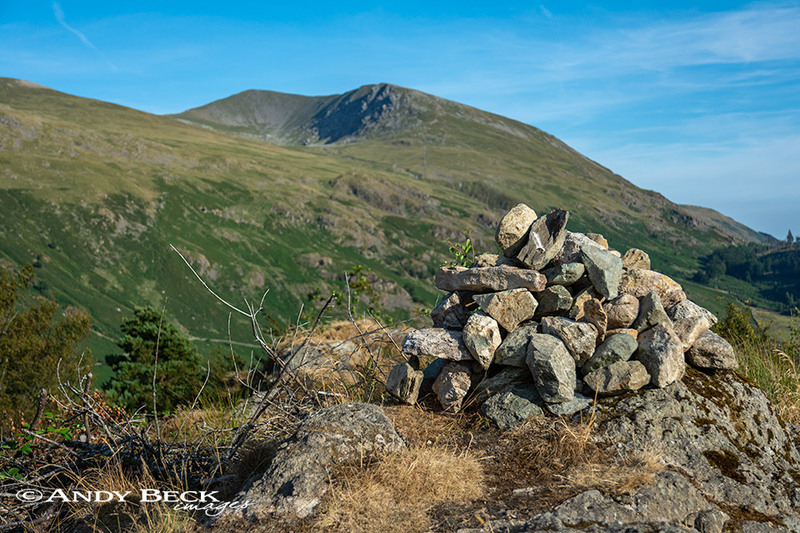 Topographical details: The high of 1092′ noted by Wainwright has now been updated to 1093′ 333m with the summit being at GR: NY31379 18719 which is marked by a small cairn shown below and is the Wainwright summit. There is another cairn on a lower summit 100m to the north close to which is a wooden bench. 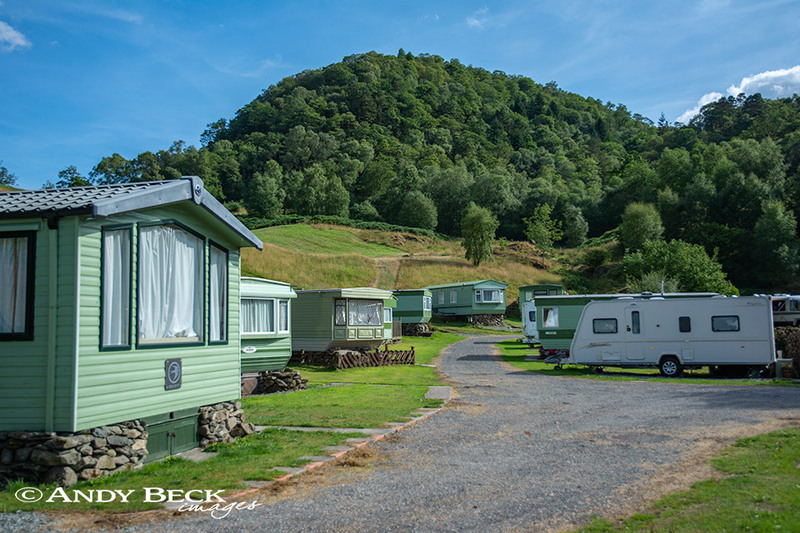 Points of interest: There is little in the way of interest on this fell apart from the excellent views of the Thirlmere valley and those to the north towards Skiddaw and Blencathra. The mature mixed woodland which covers the slopes of the fell would be rich in colour in autumn. Tarns: none. Thirlmere is to the west. Star rating: (1.4 / 5) With limited routes of ascent Great How also lacks in points of interest, the views of Thirlmere and the valley are the best points. 25/7/18 Great How (Thirlmere) direct.